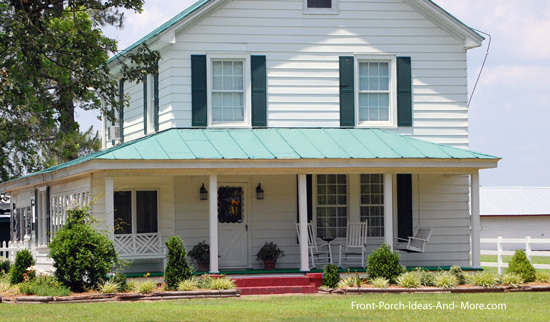 Country home designs are often defined by the front porch. 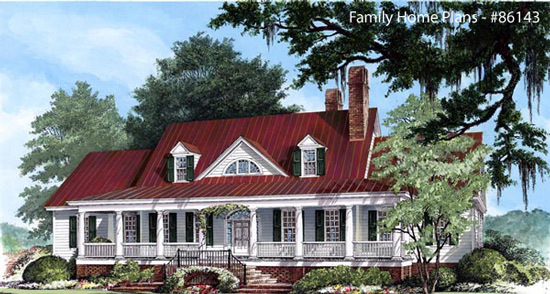 Most country homes have large wrap around porches and are often modeled after plantation or southern homes. 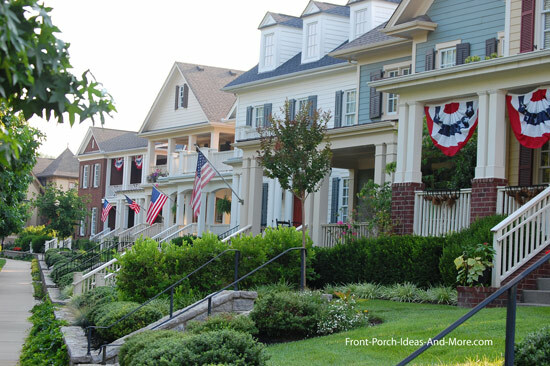 Porches add immense curb appeal while offering you a wide variety of styles. Although contemporary country homes may have smaller front porches they can still maintain the appeal of a true country porch. We not only have plans but also lots of design ideas and tips to make yours a true country home. 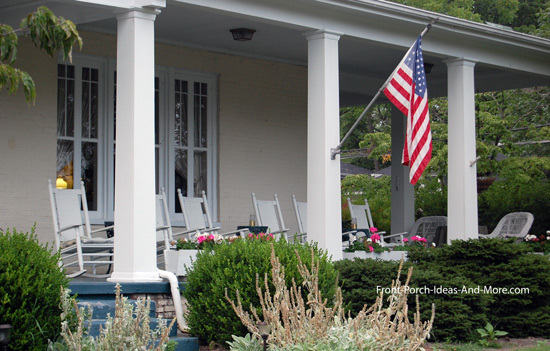 Mary and I can't help but notice a beautiful front porch on a home. Rick Bragg, a Pulitzer Prize winning author,wrote in an article titled "The Porch" published by Southern Living: "The soul of a house lies just up the front steps". 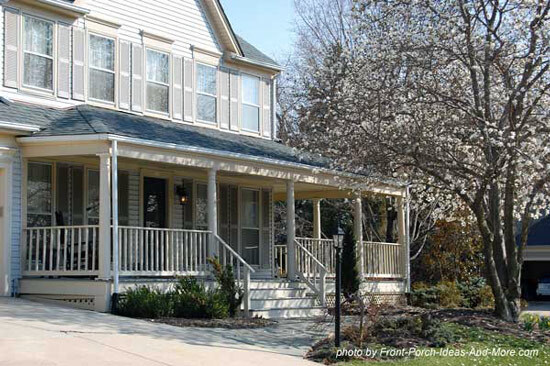 Your porch design (which generates most of your home's curb appeal) is a combination of the porch's roof, columns, balustrade (railings), and steps. Change any one or combination thereof and you can change not only your porch's appeal but also your home's as well. It is important when either designing a new home or remodeling an existing one to focus on specific features that will create the exact look you want. Mary and I will point out some interesting country home details using the photos below. 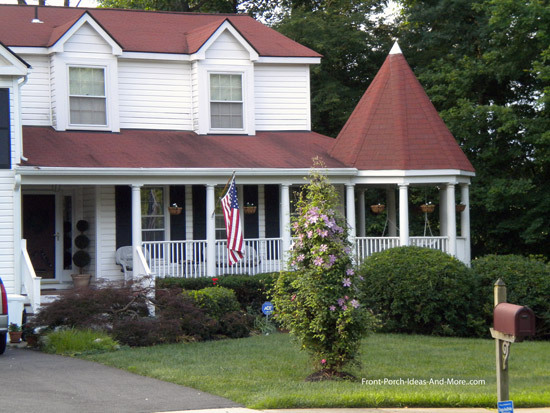 Turrets (in the photos below) are popular on large wrap around porches. By virtue of their design and construction, turrets provide additional outdoor space for larger gatherings. 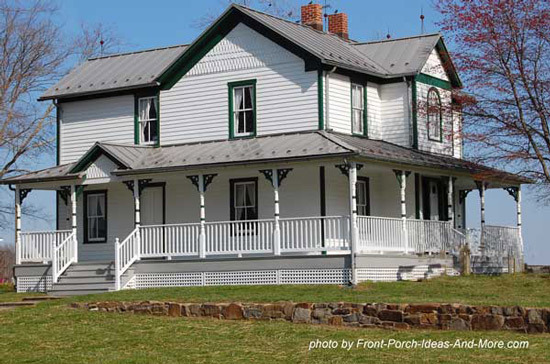 In the photo below, the porch roof consists of a shed-type roof sandwiched between two gables. It could just as easily been built with a shed roof across the entire length but this design works lots better. 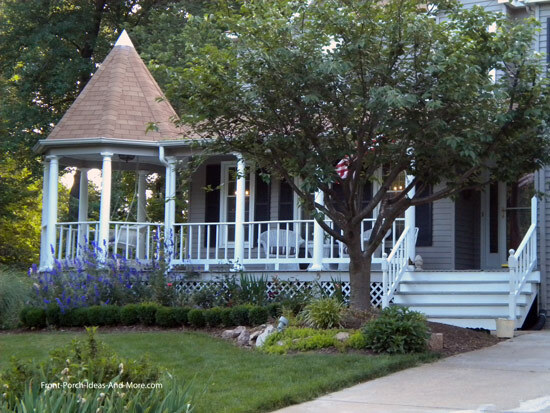 Mary and I love this porch as the roof line adds to its overall appeal. 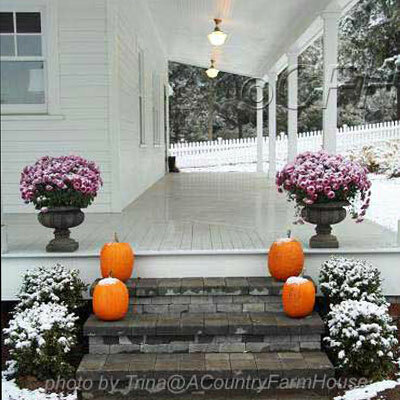 Compare the following country porches below. Both are country wrap around porches with shed-type roofs. 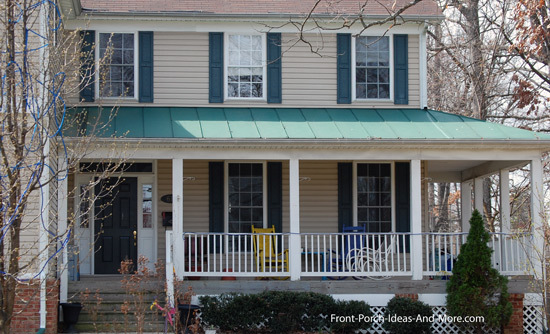 See how adding a simple gable over the entrance (second photo below) can change the overall appeal of the home. This is a variation of the gable roof placement. It has a small gable just above the porch steps and is not quite in the center of the entire roof span. 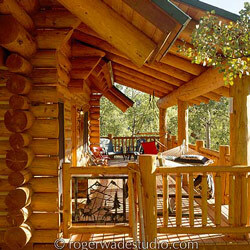 Interested in log home country porch designs? Either way we recommend you take a few moments and see these photos of custom log homes and timber frame homes. Amazing photos, loads of ideas, and beautiful country style homes. In the photos below note how the country home's roof covers the porch. This normally requires a higher pitched roof. 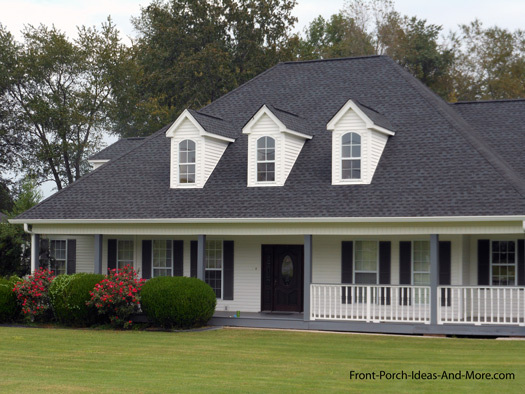 The pitch (also called the rise and run) of your home's roof usually dictates what type of porch roof you can have on your home. 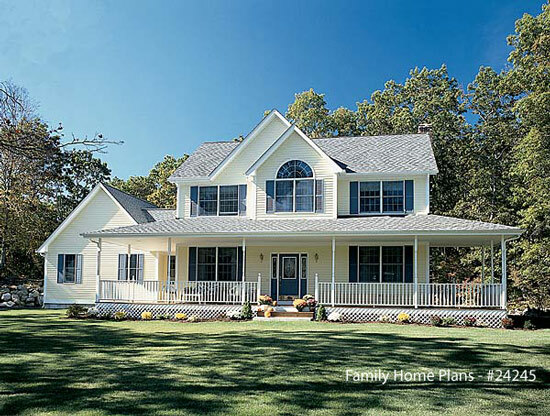 The photo below depicts a typical country home design with an added screen porch on the side of the home. It appears the left side of the wrap around porch was converted to a screened porch. Wrap arounds offer lots of options. 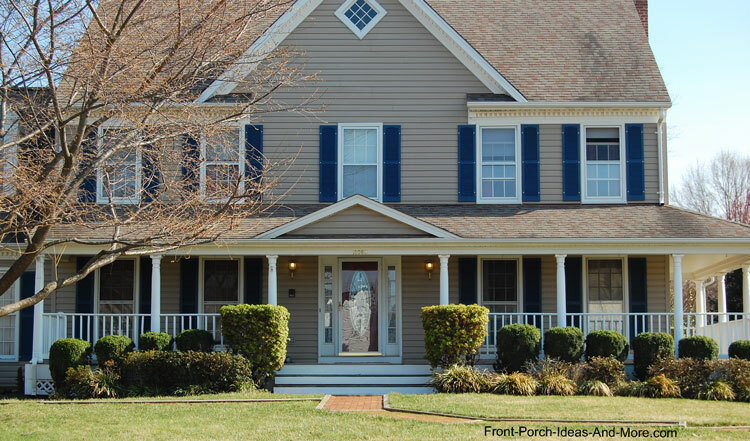 Large square tapered columns give porches a more dramatic look; however, match the size of columns to relationship to the depth of your porch. Narrow porches should have narrow-width columns whereas porches with depths larger than 8 feet (10 feet preferable) can handle larger diameter columns. Our country homes design section wouldn't be complete without addressing a few specific building issues. It is always a good idea to know and understand them before you build or remodel. Check setback requirements for your community or subdivision. This is not usually an issue if you live in a rural setting; however, most subdivisions have restrictions regarding how much distance you need between your home and the street. We wanted to add on to the front of one of our homes but quickly discovered we had a 50 foot setback requirement. So no add on for us! 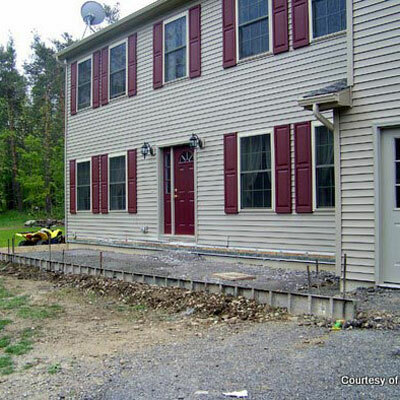 Do you want more depth to your porch but have a set back issue? Here's an idea that may help. Extend your roof two feet beyond the beam (usually allowed by building codes but check first). This will give you up to two feet of extra depth for your porch. Next, extend the flooring by using hard scaping which will not violate set back requirements. Top the hard scaping with pavers, stone, or even wood, etc., to match your porch flooring. You may have space in front but not necessarily to the side. Doors leading to a master bedroom, dining area, or perhaps a separate apartment are good examples. Make sure the main entrance to your home is obvious so as not to confuse visitors. Most additional entrances are private. The walkway and stairs should lead directly to the front door to alleviate any confusion. Problems occur when the driveway is adjacent to the side of the porch that contains a private entrance door. Confusion can be alleviated by adding an additional sidewalk or path leading back to the front. 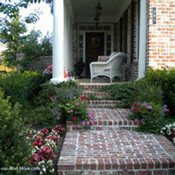 Walkways are an integral part of your front porch and home. 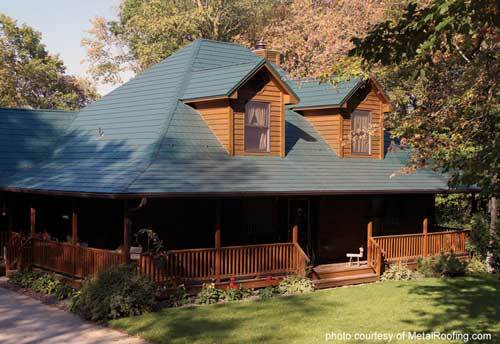 Explore your options for materials and designs to create an inviting approach to your home. 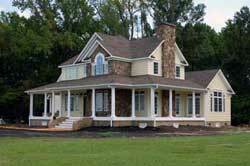 Country homes are prevalent in rural areas and in larger suburbs or neighborhoods. They are also favorites in residential coastal communities and we've noticed they continues to increase in popularity across the country. In fact, planned communities (like in the photo below) are using this design to include sidewalks and convenience stores are located nearby to recreate a sense of community among neighbors. Serenity is key to a country home. 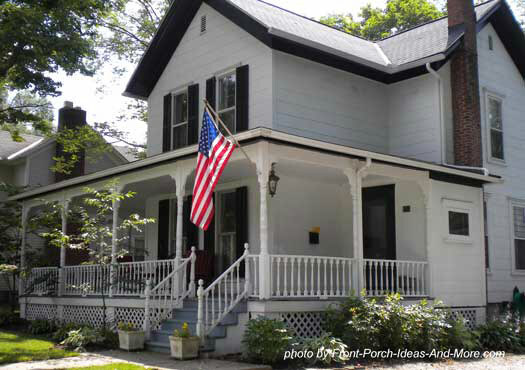 Open porches, those without railings, are our favorite. If railings are needed, plan for simple rectangular or square designs. Columns should be the same although round tapered columns can work as well. Porch curtains add lots of appeal along with ceiling fans and an old fashioned porch swing. 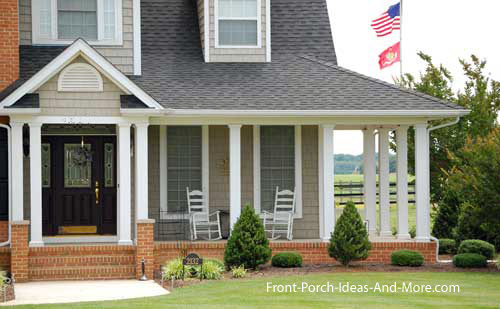 When designing your country home, be sure to take time to detail your country porch too! 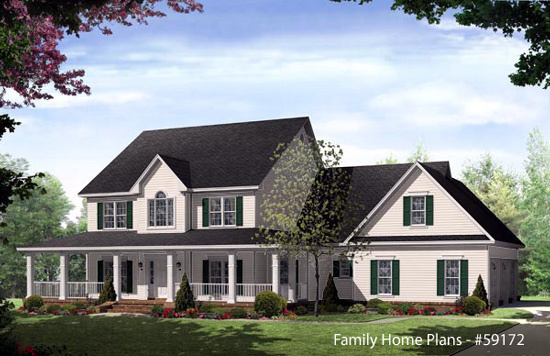 Below are several country home plans with farm house porches to give you not only ideas but also access to plans you might be able to use from which to build your own home. 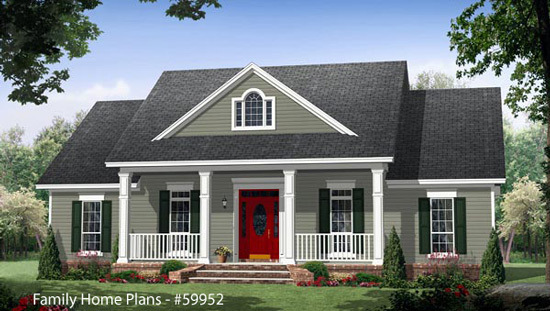 Would you like to search house plans or porch plans online? Do you want to get more details of plans you see here? Jot down the plan numbers you see with some of our pictures and go here. 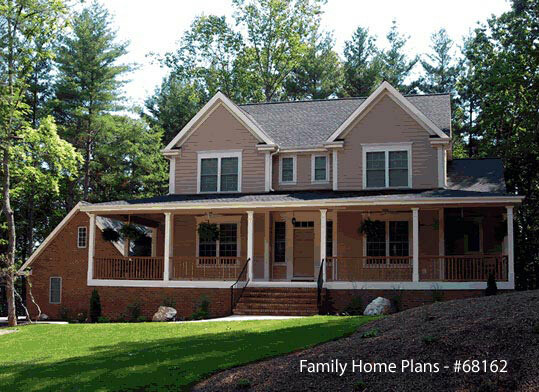 If you see a house plan you like on our site, jot down the plan # and have it handy for when you visit Family Home Plans. They have a wonderful collection of plans and most of them can be modified to fit your needs. Search to your heart's content. We may receive a commission if you purchase a plan through our link. The price is the same to you. See our full affiliate disclosure policy.